Back when I joined this outfit (the club), I learned that one of the first things I was going to need was a good semiautomatic .22 pistol. I ended up with a Colt .22 with a four inch barrel. For much of the 20th century, Colt produced the famous Woodsman .22 pistol. The Colt Woodsman was introduced in 1915 and discontinued in 1977. In the early 1990’s, Colt introduced a new .22 pistol that they wanted to call the Colt Cadet. In fact the first few of these new pistols built were marked “Colt Cadet” before they found out that they could not use that name. Apparently the folks who held the old Iver Johnson trademarks objected to Colt’s use of the Cadet name in the firearms market. The 4” Colt 22 had fixed sights, front and rear. The top of the barrel was channeled, into which a black aluminum sighting rib and the front site was screwed down. I took off the rib and front sight and cobbled together my own scope mount that used the rib screw holes in the barrel. I mounted a 2x pistol scope and enjoyed some success at our .22 pistol silhouette matches with this rig. The year after the 4” model came out, Colt brought out a 6” Target Model variation of this gun. With a longer barrel, the Target Model of course had a longer sighting plane, but additionally the rear sight was adjustable for windage and elevation. The gun included a full length aluminum rib featuring Weaver-style scope ring cross slots. It cost a little over $100 more than the basic model, but I had to have one. I sold the 4” gun to buddy Mark Snyder, and I’ve been using the 6” Target Model ever since. Over the years, I came to learn that the basic design of the Colt 22 was simply an update of a different .22 pistol, the High Standard Dura-Matic. The Dura-Matic was produced from 1954 to 1970. 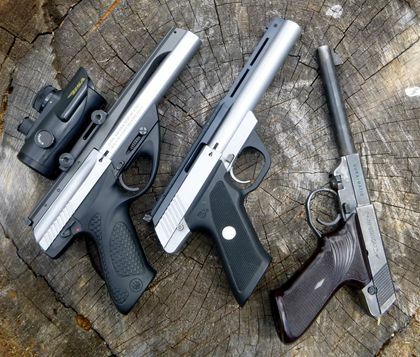 High Standard is another famous name in the world of high quality, precision .22 target pistols. The Dura-Matic however, was brought to market as an inexpensive, utilitarian plinker, to compete in the market against the Ruger .22 pistol. In 2002, Beretta introduced a new .22 semiauto pistol, the U22 Neos. It took me several years of ignoring it before I realized that it too, shares the same basic design as the Dura-Matic and the Colt 22. It seems that the Dura-Matic was too good of a design to just fade away. The heart of the Dura-Matic design is the striker, what I will call the striker tunnel, and two concentric springs. In the takedown photo to the right, you see the original Dura-Matic below its most modern offspring, the Beretta U22 Neos. At the top of the frame at the rear, you can see the striker with its back half within the striker tunnel, and the striker spring in compression. The sear is inside the bottom of the striker tunnel, where it engages a step machined into the bottom of the striker. If you pulled the trigger in this state of disassembly, you would launch the striker across the room. Poking out of the back of each slide, you can see the slide spring. When assembled, the striker and its spring sit inside of the slide spring. When a round is fired, the striker is released to strike the rim of the cartridge. The slide is blown back, compressing both the slide spring and the striker spring. At the end of rearward slide travel, the striker is caught by the sear, readying the next shot, while the slide is returned to battery by the slide spring alone. 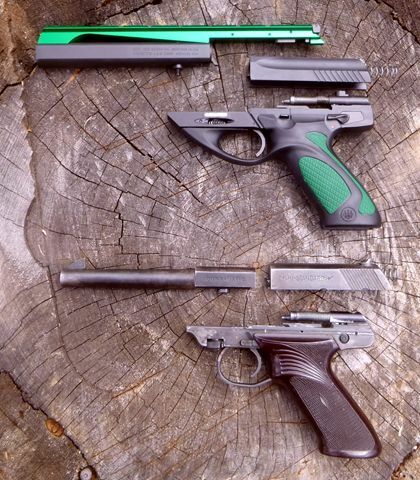 Common to all three pistols of the Dura-Matic design is a one-piece, molded plastic grip that incorporates the magazine tunnel (there’s that word again). The grip is attached to the receiver by a single long screw from the bottom of the grip. In the Colt and the Beretta, the trigger guard is part of the plastic grip. In the High Standard, the trigger guard is a separate piece of bent steel that hooks into the plastic grip and is secured to the receiver by one screw. 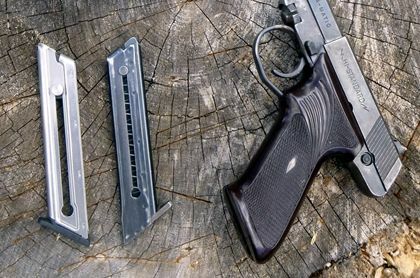 Other differences and similarities: In the H-S and the Beretta, the barrel is secured to the frame by a horizontally rotating nut in the form of a finger wheel. In the Colt, a long allen screw is removed from the front of the frame. The Colt and the H-S share a safety button that you push right to left across the back of the frame to engage. The Beretta uses an ambidextrous thumb lever in the same position at the back of the frame. The magazine release buttons are all located above the trigger on the frame. Beretta and Colt placed the button on the right side, while High Standard placed it on the left side. I’m not sure if this placement on the Berretta and the High Standard are as much of a liability as it is on the Colt. The Colt button is quite large. When in a holster, it can be easily activated accidentally. I’ve lost a magazine in the field due to this. As a result, I no longer consider this a holster gun. The Berretta button is not quite as large, so it may be less of a problem. The High Standard placement of the button on the left side means that it is on the inside of a right-hander’s holster instead of the outside, which may make it less susceptible to accidental activation. The Colt can use Beretta Neos magazines. The opposite is not true. 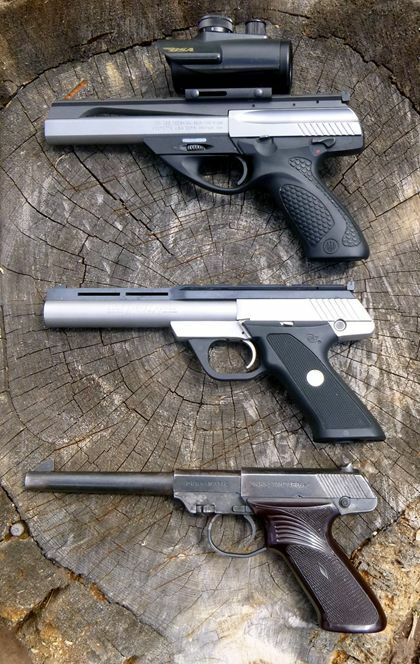 The grip of the Beretta is slightly longer than the Colt’s. When a Beretta magazine is used in the Colt, it sticks out of the bottom by about ¼ inch. But the Colt magazines are too short by that amount to be able to lock into the Beretta. The High Standard can use neither mag of its modern offspring. Standard Dura-Matic magazine on the right. The Dura-Matic slide does not lock back on an empty magazine. The slide can be manually locked back using the safety button. The slide has a circular cutout on the bottom on the left side for this safety button locking method. Both the Colt and the Beretta lock the slide back on an empty magazine. 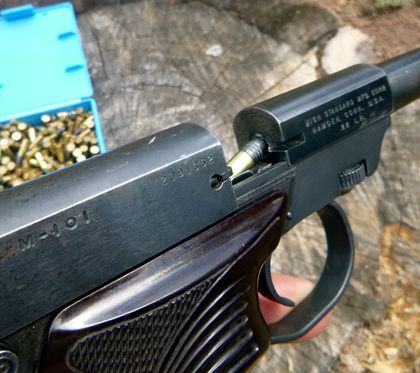 The thumb activated loading button on the left side of the modern magazines engages a slide lock lever on the left side of the guns when the last round has left the magazine. Notice that the Dura-Matic magazine’s thumb loading button is on the opposite side (the right side) of the magazine. Its only function is facilitating loading. Both the Colt and the Beretta incorporate a very important design improvement for reliable feeding: a feed ramp. The High Standard does not have a feed ramp. As a result, High Standards, and not just the Dura-Matic, have a reputation for “tempermental” operation. Because there is no feed ramp, the separation of the magazine feed lips has got to be exactly right to properly present the next round to the chamber. There are resources on the web that give you the exact measurements of the front and rear feed lip separation, and give you instructions on how to build a tool to bend the feed lips to achieve the proper “tuning”. So how did I end up with all these pistols, after all? If you’ve been paying attention to the photos, you will have noticed one High Standard Dura-Matic, one Colt 22 Target Model, and two different Beretta U22s. Well the Berettas are my sons’, Ben and Sam. They were each gifts from Pop. They were as close as we could get to Dad’s favorite Colt. The Dura-Matic is a recent acquisition. I’ve been wanting to pick one up for a long time, just to have an example of the original. I saw one advertised on Backpage, but better yet, the ad said that the owner was willing to trade for a motorcycle project. Well! I had exactly that in my backyard, two rolling frames that wanted to be one good bike, that I just could never get up the gumption to finish. My wife is never happy when I come home and say, “Want to see my new gun?” You should have seen the look of daggers in her eyes when I said that. But that face turned to one of delight when I led her to the back yard to see two trash bikes gone! I took all the pistols up to the cool country for a camping, shooting, and story-writing expedition, where I got to shoot the Dura-Matic for the first time. All was not honey and roses. First of all, with the safety engaged, the striker can still be released by pulling the trigger! Oops! I will have to do a detailed disassembly to find out what internal part is worn out that allows this. Then the challenge will be to see if Numrich Gun Parts happens to have the part available. Next, the plain lead-head rounds I had on-hand, Remington Thunderbolts and Lapua Club, would jam at the top of the chamber when feeding from the magazine. I’m going to have to learn High Standard magazine tuning it seems. I also had along some copper-plated Federal 525 Value Pack ammo. Those actually fed pretty reliably. I think that I had one or two stoppages, but that’s it. Overall, the pistol has a really nice feel in the hand. The shape of the grip, and the balance of the long and slender barrel just feels right. The High Standard Dura-Matic is dead. Long live the Dura-Matic!